Douglas Heatlie from Selkirk won the Scottish individual cleaner title for his efforts maintaining the public toilets at the Avenue in Lauder. He picked up his title at the Loo of the Year ceremony at Solihull near Birmingham this month. The awards aim to recognise the highest possible standards for toilet facilities across the UK. Douglas began working with Ettrick and Lauderdale Council in 1983 as a general labourer, cleaning toilets and sweeping streets before moving onto his current role. Douglas’ cleaning colleagues were also recognised as we won best Scottish local authority for the maintenance of a series of public toilets across the area. “Douglas’ award has reminded me that we in the Council, and the public we serve, are indebted to people like him who do their job daily without any fuss and give a service beyond his job description. “Douglas, and the other members of the team, deserve our thanks. Well done to them all." We are currently carrying out a review of its public toilets, with its first phase seeing charging introduced to 27 of the 41 facilities in the Borders earlier this year, while 14 toilets remain free to use. The first phase also included engagement with communities and businesses about the potential introduction of a Borders comfort scheme, which has led to almost 40 expressions of interest from across the area. We would still like to speak to any organisations who would like to get involved. 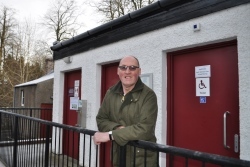 As the review continues, the independent assessments from the Loo of the Year judging panel will provide highly useful information to enable the Council to create a longer term strategy for public toilets in the Borders. Images are available at our Flickr page. Information on the Loo of the Year awards is available. Information on our public toilets review is available.